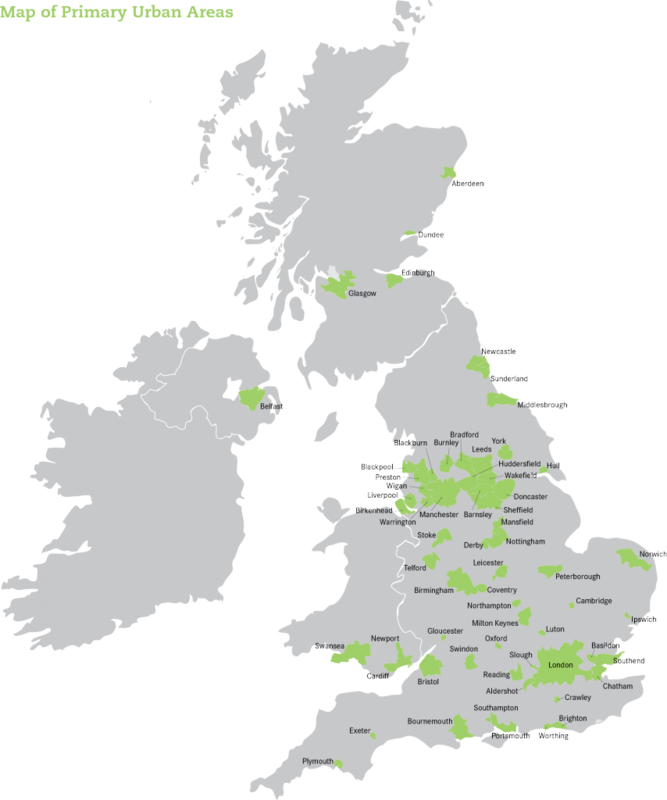 The Centre’s research focuses on the UK’s 63 largest towns and cities, defined as primary urban areas (PUAs). Unless otherwise stated, Centre for Cities uses data for PUAs in its analysis – a measure of the “built-up” area of a city, rather than individual local authority districts. We use PUAs in our analysis because they provide a consistent measure to compare concentrations of economic activity across the UK. This makes them distinct from city region or combined authority geographies. Find a table detailing each PUA and how it is defined, here. You can find data factsheets by PUA on our city by city page, and data tool. Please note that since 25 January 2016, Centre for Cities has been using a new PUA definition, following a review undertaken with CURDS, University of Newcastle. You can read the methodological note here. Map of the 63 Primary Urban Areas.